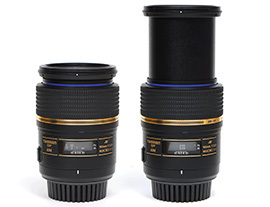 Which 100mm macro lens should I choose for my full-frame camera? With a DxOMark overall score of 23 for the Canon mount and 22 for the Nikon, the two 90mm Macros are for all intents and purposes identical. Vignetting, with a loss of 1EV in the last 1/3 of the field at f/2.8. Noticeable chromatic aberrations in the corners. What might be the best 100mm macros for Canon cameras? 1st place at 28: Carl Zeiss Makro-Planar T 100mm f/2 ZE Canon. 2nd place at 25: Canon EF 100mm f/2.8L Macro IS USM. 3rd place at 23 (tie): Tamron SP AF 90mm F/2.8 Di MACRO Canon and Sigma 105mm F2.8 EX DG Macro Canon. 4th place at 18: Canon EF 100mm f/2.8 Macro USM. Of note for those with a limited budget, Sigma and Tamron offer very satisfactory alternatives in terms of image quality… and which are nearly 2 times less expensive than the L series. Also note that the Canon EF 100mm f/2.8 Macro USM is a bit dated: there is a 10-year gap between the first and fourth versions. Note: The difference between the Zeiss and the other cameras is very small, and in fact all the lenses have excellent sharpness. Note: The difference of 1.25 EV can be important under low-light conditions. Note: Vignetting equal to or greater than -1.5EV is significant and noticeable. Note: A LCA score of 3µm means that the aberrations are so insignificant that no post-production editing is required. But at 11µm, LCA is starting to get serious, which means a significant increase in post-processing time. What might be the best macro lens for Nikon cameras? The rankings here are a bit less close, with both Nikon and Carl Zeiss providing an exceptional lens for Nikon mounts. All this said, if you want to own the best macro lens for your Nikon, you will want the Nikkor AF-S VR Micro-NIKKOR 105mm f/2.8G IF-ED (DxOMark score of 34).